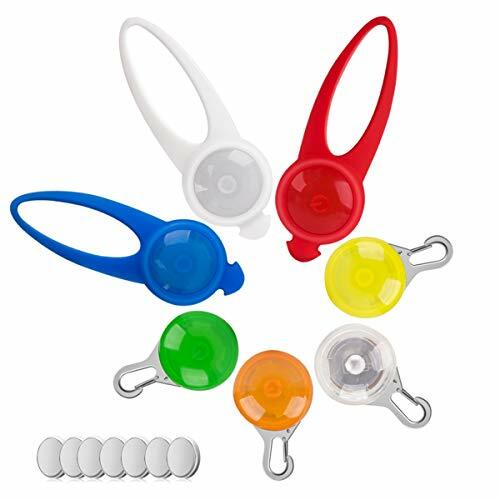 ✔ Multi-purpose & Bright -- Lightweight, durable safe light to your pet's collar; or use as a Carabiner, Keychain, locate tent lines and camping gear. Very bright flashing LED light can be seen up to 1/2 mile away. ✔ Safety & Charming -- This flashing led dog collar blinker can provide flashing Led light to keep pet's highly visible and safety at night or in a low light environment; This flashing led dog safety light is the great gift for dog and offer charming lights, make the dog more fashion and attractive. Make your dog is the most fashion and popular star in the dogs. ✔ High Quality & Silicone Case -- This pet dog collar LED light is made of 100% silicone high quality and CE & ROHS Certification Standard materials, can offer comfortable wear and full safety. waterproof function and worry-free in all weather. ✔ Easy Operate & Long Lasting -- Only turn on/off by clicking the center button for this glowing dog collar blinked to 3 models: Quickly Glowing, Slowly Glowing, Steady Glowing and OFF. The glowing time of this dog light can last 100 hours, longer than standard pet collar blinker. ✔ Light Weight & Free Bouns -- Morpilot pet safety light is lightweight and durable, no extra pressure or weight on your dog, cat or pet. The battery can be replaced (Extra 7 batteries +3 silicone cases).